UCLA ranked No. 6 among top LGBT friendly campuses in U.S. 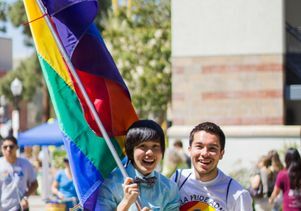 In 2015, UCLA students Jennifer Deng and Drew Tran were mentors at Pride Admit Weekend, the first LGBT overnight program for newly admitted students. UCLA has been designated No. 6 on College Choice’s list of Best LGBT Friendly Colleges and Universities published this week. 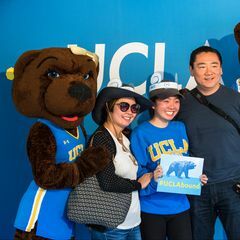 According to the ranking by the independent online publication that’s dedicated to helping students and their families find the right college, UCLA is the only public university in the top 10 and one of three UC campuses in the top 50. UC Davis is No. 20 while UC Riverside is No. 47. The rankings are based on publicly available information on accreditation; a rating determined by Campus Pride, a national nonprofit organization that annually surveys students and assesses the LGBT friendly campus climate at nearly 300 colleges and universities; academic reputation; student satisfaction; affordability; average financial aid awarded; and return on investment. Dean of Students Maria Blandizzi said she was “ecstatic” after learning how well UCLA did in this ranking. 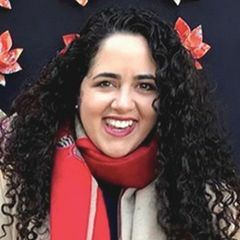 “As the first-ranked public institution on the list, this acknowledges the long-standing advocacy work that our students, faculty and staff have been engaged in throughout the movement to bring LGBT human rights into our collective conscience, on our campus, within the state and across the nation,” she said. “This honor propels us forward to keep on in the struggle." To further enhance campus inclusion and equity for LGBT students, staff, faculty and visitors to campus, UCLA is working to increase the number of single-stall, all-gender restrooms available on campus. The campus currently has more than 150 such facilities, and this number is expected to double by the end of June. UCLA has been a leader in LGBT research, advocacy and education since the 1950s. The campus is home to OutWrite, the nation’s oldest campus-based queer newsmagazine, and OutFest, the country’s leading LGBT festival. In addition, UCLA offers a minor in LGBT studies; more than 21 LGBT-related student organizations; several gender-neutral housing options; a themed floor in a residence hall to house students interested in gender, sexuality and society; and the annual lavender graduation ceremony that honors LGBT students and their supporters. And 2014 marked the first Pride Admit Weekend for admitted freshmen. UCLA is also home to the School of Law’s Williams Institute, a national think tank dedicated to conducting rigorous, independent research on sexual orientation, gender identity law and public policy. The Ronald Reagan UCLA Medical Center has earned the distinction of being designated a “Leader in LGBT Healthcare Equality” by the Human Rights Campaign Foundation, the educational arm of the country’s largest LGBT organization. UCLA has previously been recognized for its support of LGBT students. 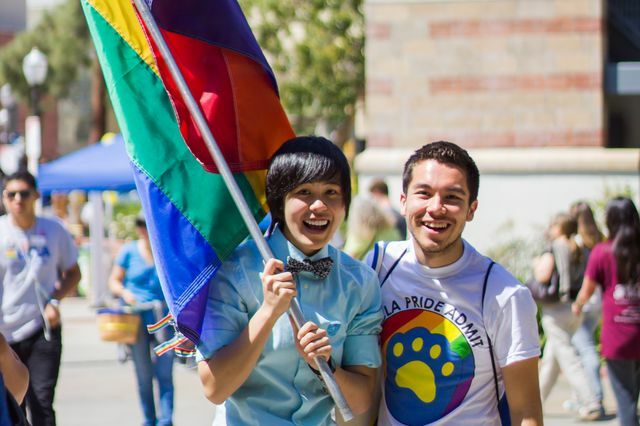 Campus Pride listed UCLA among the Top 50 LGBT-Friendly Colleges and Universities in 2014 and Top 10 Trans-Friendly colleges and universities in 2013.